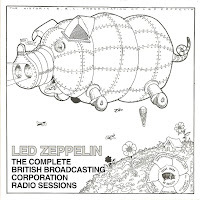 Four songs from the BBC Studios, all but Communication Breakdown made it to the official BBC release. Great quality of course. You Shook Me, Communication Breakdown, I Can't Quit You Baby and a 'short' Dazed and Confused (under 7 minutes). Everything comes thru clear, Page's guitar stands out a bit, but that's not really a problem. The official release is cleaner and brighter of course, but the bootleg version is great quality as well, a touch of distortion but overall very good.